Keeping your dog active during the winter months is the easiest way to ward off those winter blues. Just like you, they need exercise to maintain a healthy, active mind. Here at The Pet Beastro, we fight winter blues with simple supplements, fun chews, dog puzzles, and small nutrient-packed treats for activities. 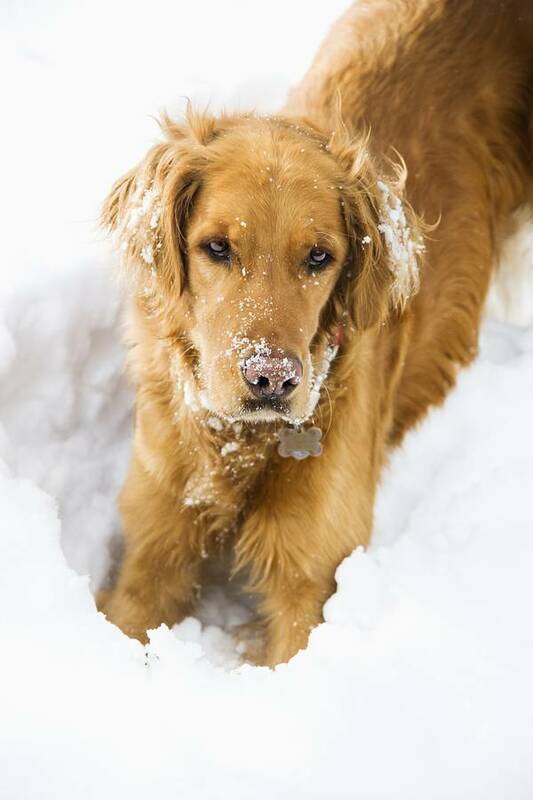 GroundWorks Natural Icemelter and Musher’s Secret are some additional tools to have handy to help safely keep your dog active outdoors during the ice-covered months. Supplements can be a great help to our animals during the winter. Three of our favorites are Pet Kelp, bone broth, and Animal Essentials Vitality. At The Pet Beastro, we are big fans of kelp. Pet Kelp Wellness formula harnesses the power of Nova Scotia-sourced blueberries. Anthocyanins (their dark blue pigment) create an antioxidant-rich super supplement perfect for the winter weather. Straight from Nova Scotia, Pet Kelp has been a tried and true staple of the Nova Scotia sled dogs' diet for over 100 years. This supplement is beneficial for dogs and cats alike. Pet Kelp has a unique four-kelp combination that is rich in vitamins, minerals, Omega-3’s, and amino acids. Flaxseed is also included, which will help maintain a healthy skin and coat during the cold months. The Honest Kitchen Bone Broth powdered supplement is perfect for January. Bone broth contains vital nutrients and fat that support your animal's gut by providing the building blocks for healthy cell growth. Bone broth also soothes any inflammation along the gut lining, while also providing amino acids essential for healthy brain function. This age-old superfood has been proven over the centuries to help rebuild the gut of humans and animals alike. The turmeric used in Honest Kitchen's formulation is a high-potency extract with 95 percent curcuminoids, an active compound that boasts anti-inflammatory and antioxidant properties. This five-ounce canister makes 10 cups of bone broth. Warm or cold, this supplement can be served on its own or used to rehydrate food, or even to pour over kibble. With only four ingredients (beef bone broth, parsley, pumpkin, and turmeric extract) you will find this product so versatile and beneficial for your animal companion that you may even want to take a sip yourself (You totally can, by the way; it's human grade!). Next up is Animal Essentials Vitality. This liquid supplement is perfect for picky cats or dogs who are weary of pills and powders. This supplement supports immunity by improving your pet's body’s reaction to stressors. The herbal tincture contains Astragalus root, Eleuthero (Siberian ginseng) and Spirulina (blue-green algae). The astragalus root boasts many beneficial properties to the immune system. This ancient Chinese root is an adaptogenic, antiviral, antioxidant, cardiovascular toner, diuretic, immunostimulant, laxative, liver protector, gastrointestinal tract strengthener, and more! Eleuthero is a Siberian ginseng that aids in colds, arthritis, high cholesterol, and fatigue. This herb helps manage stressors taken into the body by the environment. Spirulina is a quite common super supplement that not only contains a massive amount of protein and amino acids, but also Omega-3 fatty acids, calcium, and phosphorus. You can probably see why this powerful combination is perfect for working dogs and elderly animals. Maintaining your pet's immune system during the winter months is as important as maintaining your own! Demineralization is the fasting cause of aging on the market. Break the winter cycle of demineralization and keep your pet at optimal health all year-round with Animal Essentials Vitality. The serotonin released during chewing for dogs will not only calm your animal down but will also release energy that they may have pent up from being indoors during the cold months. Cloud Star Dynamo Dog Functional Chews are a semi-hard chew, perfect for pups with allergies. These chews are free of grain, gluten, and potato. All flavors are textured to help remove plaque and tartar buildup. This chew comes in sizes for small, medium, and large dogs, so no one is left out. Dynamo Tummy, a pumpkin and ginger formula, is a great chew for dogs with sensitive or upset stomachs. This formula also includes probiotics and enzymes that assist in the breakdown of food for proper nutrient absorption. Dynamo Hip & Joint, chicken chews, contain yucca schidigera to help manage pain; glucosamine and chondroitin to help maintain bone structural health, and green lipped mussel to help maintain muscle ligaments and tendons. The Dynamo Breath dental chews contain chlorophyll, parsley, and peppermint to help fight bad breath and aid in digestion. Looking for a meatier option? Try Earth Animal's No Hide Chicken Chews. This naturally-sourced and produced rawhide alternative is 100-percent digestible. It is also USA farm-raised and antibiotic-free. These chews also promote healthy teeth and gums. Earth Animal No Hide Chicken Chews come in three convenient sizes: 4” 2-pack, 7” 2-pack, and a bag of 10 stix for tiny chewers. These chews are also a natural source of glucosamine and chondroitin, making them great for all ages and sizes of chewers. It never hurts to have puzzle toys around when cabin fever starts to set in. Nina Ottosson has multiple designs and sizes, optimal for any size of dog or cat. These puzzles range in difficulty as well. They are great for indoor or outdoor play and rely on your pet's sense of smell. Puzzle toys also work well for dogs that always seem to inhale their treats so fast that they are left wanting more. Puzzles not only slow your pets down a bit but also make them work for their treats, utilizing their brains as well. A perfect treat to pair with a puzzle toy is a training treat. At The Pet Beastro, we have multiple training treats in different flavors and sizes. It would be hard to find one your pet won’t take to! Etta Says Little Bitz training treats come in four flavors, are packed with protein, and are grain-free. Off Leash treats by Complete Natural Nutrition are another grain-free training treat that only has calories. This treat is also easy to break into smaller pieces and won't crumble! Fruitables Skinny Minis are always a great standby. There are five flavors ranging from buffalo to mango, all with just two and a half calories. To keep your pet's immune system and taste buds alive this winter try BIXBI’s Daily Essentials. This jerky treat comes in pork, chicken, beef, and salmon proteins. Each flavor has added blueberries, cranberries, and reishi mushroom to keep your pet's immune system at its peak. These are almost like a multivitamin in a treat! The dynamic protein selection is great for animals with allergies, as well as offering a rotation for the everyday user. Let’s not forget about our feline friends! To go along with their puzzle games or even just for fun, Vital Essentials has a new line of single-sourced protein cat treats. These treats are all gluten-free and USA-sourced. They're also delicious! With seven proteins to choose from, your cat has quite the selection. Last but not least, keeping your furry companion's paws protected from the elements is a must this season. GroundWorks Natural Icemelter is a must-have for all pet owners and non-pet owners this season. This ice melt is a chemical-free, fertilizer-based ice melt that is safe for animals, children, plants, and soil. Groundworks is colorless, odorless, and powerful all the way down to -23 degrees Celsius. The ice melt begins to work immediately. You can rest assured that it will not change the vegetation or soil structure, as most chemical-filled melters do. You can also store this product for extended periods of time with no damage or specific storing conditions. GroundWorks comes in a 12-pound refillable container, a 22-pound refill bag, and a 50-pound plastic container with a lid. Musher’s Secret is Fido’s best friend in the winter - aside from you, of course. Musher’s Secret is a breathable wax barrier that originated in Canada with their famous sled dogs. These waxes are food grade, so no worries if your dog sneaks a taste. This product absorbs into your dog's paws and protects them from the freezing cold ground, while also allowing perspiration through the breathable wax barrier. Musher’s Secret is also a great product to use during the summer months to protect from hot sand or pavements. Although hibernation during this frigid weather does seem appealing, activity is critical to keeping your pet happy and healthy all year round. Whether you are keeping active outside on a brisk walk or inside with a few nice heavy chews, we hope we have added some tools to your arsenal so that you can confidently survive winter while knowing that your pet is still getting everything he/she needs. From simple supplementation to mind-boggling puzzle games, we have everything your pet needs for a happy, healthy, and treat-filled winter. To help you stock up, we've marked many of these products down for the month of January in our store and online market. For the full list, be sure to check out our monthly specials! Pawsome! We appreciate the link back! "Maintaining your pet's immune system during the winter months is as important as maintaining your own!"